(It is interesting to say the least, that Santa Clara County Social Services director: Will Lightbourne, who was responsible for the missing 72.5 Million dollars was promoted to director of California Dept. of Social Services with a very impressive benefits package ) Crittenden had been asked to investigate whether there was a connection between these events and had been warned by coalition member connected with an investigation that an associate of Lightbourne with seat on California State Legislature may covertly interfere with proceedings to 1-12-CV226958 and another court case in San Mateo County. 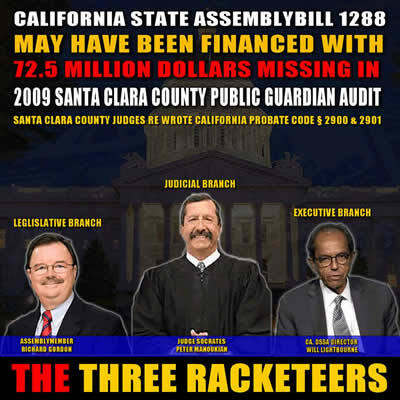 Judge Socrates Peter Manoukian had direct financial interest in assembly bill 937 because passage of the bill would hinder his ability to profit from seizure of real estate through the collusive relationship between court department 19 and department 3 – (Honorable Judge Thomas Cain) Judge Socrates Peter Manoukian was functioning as “Probate court linebacker”, manipulating results of department 19 proceedings in a manner which would affect corresponding proceedings in department 3. The revenue flow Judge Manoukian would receive from department 3 kickbacks would be directly impacted by passage of this California State assembly bill. 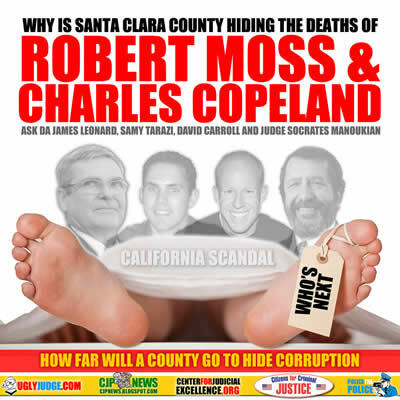 Santa Clara County deputy district attorney James Leonard was homicide prosecutor at the time Robert Moss’s death which does not appear to have been investigated. (Late October / Early November 2012) A 2016 audit revealed that during the same 2012 time period, some improprieties were discovered at the Santa Clara County Coroner’s office involving mishandled autopsies. On November 16th, 2012, shortly after Robert Moss’s death, a suspicious transaction appeared in Santa Clara County’s Grantor/Grantee index under James Leonard’s name which may be a bribe. The document number associated with this transaction is 21955252. “In the process of reviewing Crittenden’s allegations and his several arrests, this reporter did a search for James Leonard’s financial transactions vis a vis his home loans, on the Santa Clara County Grantor Grantee index. It is known that members of the government legal profession, be they district attorneys or judges, have laundered pay offs through their home loans. The search for Leonard’s home loan history produced concerning results. It appears that Leonard has reconveyed loans on his personal property no less than ten times in the past fourteen years. This excessive loan activity is generally seen as a red flag, indicating that a public official may very well be feeding at the “pay off/bribe/money laundering” trough. In 2014 Cary Andrew Crittenden, Santa Clara County Sheriff Detective David Carroll and Deputy District Attorney James Leonard framed Cary Andrew Crittenden on fake harassment charges (DOCKET C1493022) for his participation in campaign to address a fraudulent declaration submitted by Robert Ridgeway in case 1-12-CV226958. This fraudulent declaration, which was likely a contributing factor in Robert Moss’s death, referred to nonexistent video evidence claiming Mr. Crittenden was residing at Markham Plaza Apartments. Detective David Carroll filed a false police report 14-182-0167 with very little factual basis to serve as “smoke screen” Robert Ridgeway’s wife, Santa Clara County Sheriff Deputy Aleksandra Ridgeway also participated in false police report. On October 16th of 2014, Crittenden prepared a “Marsden Motion” and motion to withdraw plea “guilty” and appeared in court before Judge Rodney Stafford. Upon entering the court room, Sheriff Deputies seized Crittenden’s court documents and arrested him for publishing a news article about the facts of the case, and the malicious prosecution. Mr. Crittenden was led by sheriff deputies from the courtroom and placed in a holding cell with cardboard over the window where he was then tortured by Santa Clara County sheriff deputies. Crittenden reported to Santa Clara County probation department and asked probation officer Doug Davis for the terms and conditions of probation in writing. Crittenden was then finally given paperwork showing terms and conditions of probation which showed that he had waived his 2nd amendment rights and 4th amendment rights, but he had not waived his first amendment rights and therefore DID NOT, IN ANY WAY, SHAPE OR FORM, VIOLATE THE TERMS AND CONDITIONS OF PROBATION by publishing a news article informing the public about the facts of the case and the fraud that had occurred. Officer Doug Davis was then replaced by officer Michele Martin. Detective David Carroll had been removed from the case and there was sufficient documentation regarding the stalking, harassment and threats against Crittenden by detective David Carroll that occurred prior to original arrest demanding he not bring public attention to the matter. While in custody, a fraudulent motion to disqualify district attorney’s office was filed by Santa Clara County Deputy Public Defender Amanda Parks, claiming the grounds for motion was because “James Leonard was named victim” when the real reason for motion to disqualify was likely because James Leonard was homicide prosecutor at time of Robert Moss’s death. The motion to disqualify was heard by Santa Clara County Superior Court Judge Michele McCay McKoy who was also homicide prosecutor for Santa Clara County District Attorney’s office when Robert Moss was discovered dead. The perjured motion to disqualify contained “Declaration of Facts” that WERE NOT FACTS, but attempts rather to reaffirm the string of falsified police reports and fake court records which the public defender’s office knew to be false, yet they refused to investigate. The VOP charge was eventually dismissed and deputy district attorney James Leonard (and subordinate prosecutor Alexander Adams) were replaced by deputy district attorney Barbara Cathcart who then proceeded to railroad Crittenden on fabricated charges in case C1527283 based on false reports, fabricated evidence and lies. mounds of exculpatory evidence was excluded and Crittenden was not allowed to call witnesses to his defense. After gag order was issued against Crittenden in October 2016 by Judge Sharon Chatman prohibiting him from speaking about the crimes committed against him, a second death was reported, that of Charles Sydney Copeland which is also linked to Judge Socrates Peter Manoukian and covered up by the Santa Clara County District Attorney’s office. In Memory of a VETERAN who has FALLEN DEFENDING HIS RIGHTS, IN THE COUNTRY HE SERVED. My father CHARLES S. COPELAND was a Navy Vet, retired from NASA. I witnessed the public guardian Shawn Parr laughing and stating “it’s like stealing candy from a baby!” outside the courthouse when they conserved my Dad, after falsely stating he was not a vet!!! They transferred 10 million in assets to Hai P Tran, the VP of Fidelity, the Trustee for Santa Clara. Mortgage Companies were used to immediately remove all equity, and my father died fighting to recover his estate which was distributed through Tran to associates of the County’s family trusts. My father was left dead in Tran’s house for 3 weeks, and the DA refused to investigate! He failed to appear, after asking for expert opinion of evidence presented by Tran’s attorney, Ann Nguyen of Robinson and Wood. I filed complaints against Judge Grilli who granted final assets to Tran’s relative (which were not conserved) with the Commission on Judicial Performance, and the President Erica Yew recused herself because she was a Partner of Robinson and Wood, and sits on the bench with Grilli, approving final distributions of conserved assets. Robinson and Wood also represents the mortgage companies used to remove all equity from estates. Attorney John Foley was assigned special notice as conservatee’s attorney, and Michael S. Miller was used to transfer all assets to Tran, with the Public Guardian’s approval. Coincidentally, M.S. Miller lost his license to elder fraud, (assoc of Grilli’s former partner?? through Miller & Grilli???)! This proves lack of judicial oversight and possible RICO actions. Grand jury reports revealed over 70 million in unaccounted public guardian assets!!! They also investigated the coroner’s office which had 3 coroner’s quit due to corruption the year my dad was found dead in Tran’s relative’s house where they left him for 3 weeks while they finished stealing everything he ever worked for. They are organized crime! Tran has hundreds of similar transactions throughout every county in CA through Fidelity etal! William Foley is the Chairman of Fidelity (rel of John Foley? ), Michael Miller has a PAC, LLC. I believe its a corrupt political funding machine!!! Manoukian was the last judge to preside in the case prior to my father’s suspicious death!!! Tran was arrested in Santa Clara and taken back to O.C. for hiring a hitman around the same time! see news report! They are organized, experienced, and believe they are above the law, because they have infiltrated and abused it for their own financial gain!!! They are all taking a piece of the pie. They have their corrupt people in place! 2 doors were kicked in and I got a call from a man names John Zimmerman (Pres. of Robinson and Woods!) after filing my complaint! My Dad’s final request for expert opinion of his case evidence will be fulfilled! Contra Costa papers do not usually print letters from out-of-county. Unlikely that Internet-only media would “print” a letter except in response to something on the site.